Do not strike or jolt the inflatable restraint sensing and diagnostic module (SDM). Before applying power to the SDM, make sure that it is securely fastened with the arrow facing toward the front of the vehicle. Failure to observe the correct installation procedure could cause SIR deployment, personal injury, or unnecessary SIR system repairs. Disable the supplemental inflatable restraint (SIR) system. Refer to SIR Disabling and Enabling. Remove the front floor console extension. Refer to Front Floor Console Extension Replacement - Left Side or Front Floor Console Extension Replacement - Right Side. 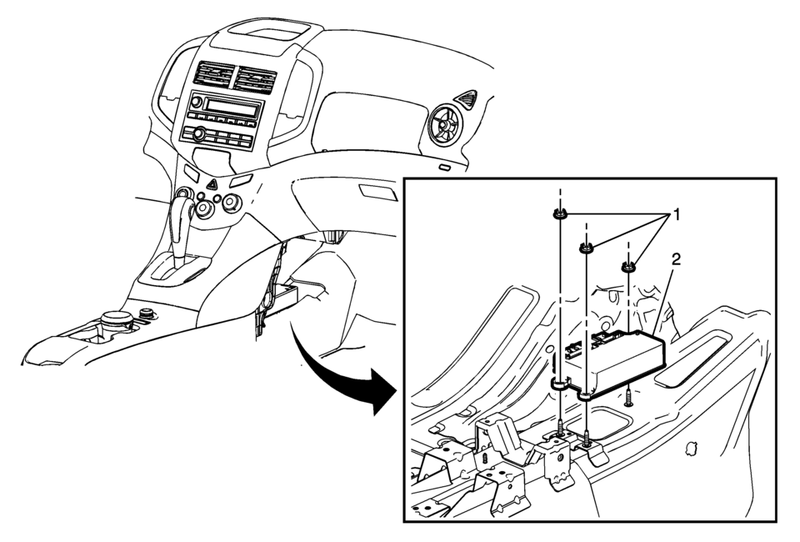 When installing, ensure the arrow on the module is pointed towards the front of the vehicle. If installing a replacement module, program the module. Refer to Control Module References.